California State University, Northridge President Dianne F. Harrison spoke at H.O.P.E. 's House Christian Ministries in Granada Hills as part of the CSU Super Sunday event, where CSU leaders shared personal stories at predominantly African-American churches to reinforce the benefits and achievability of a college degree. Photo by David J. Hawkins. California State University Trustee Jorge Reyes Salinas '15 (Journalism), spoke at Living Praise Christian Center in Chatsworth as part of the CSU Super Sunday event, where CSU leaders shared personal stories at predominantly African-American churches to reinforce the benefits and achievability of a college degree. Photo by Patricia Carrillo. Four CSUN leaders participated in CSU Super Sunday, a statewide event for which leaders, trustees, campus presidents and alumni visited nearly 100 churches across the state to encourage students to pursue higher education. 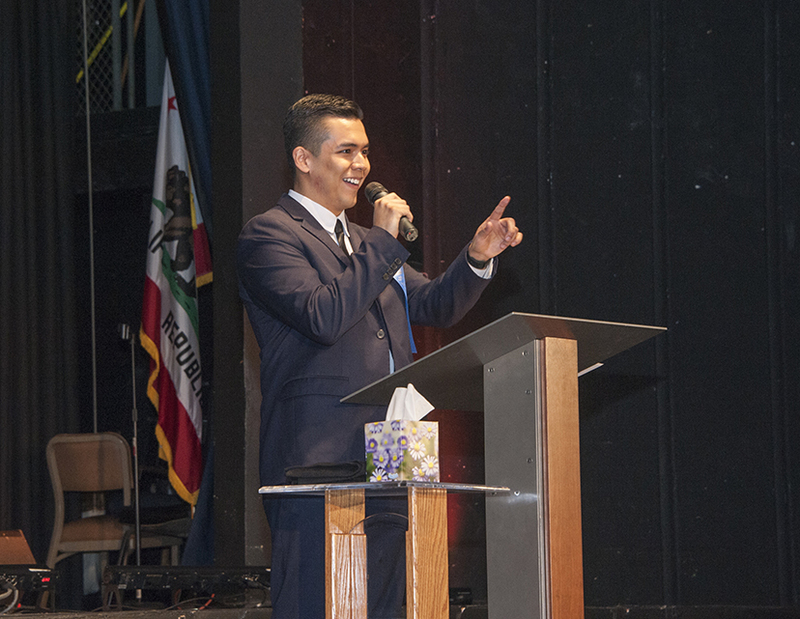 California State University Trustee Jorge Reyes Salinas '15 (Journalism), spoke at Living Praise Christian Center in Chatsworth. Photo by Patricia Carrillo. CSUN outreach specialists visited H.O.P.E. 's House Christian Ministries in Granada Hills as part of the CSU Super Sunday event, where CSU leaders shared personal stories at predominantly African-American churches to reinforce the benefits and achievability of a college degree. Photo by David J. Hawkins. 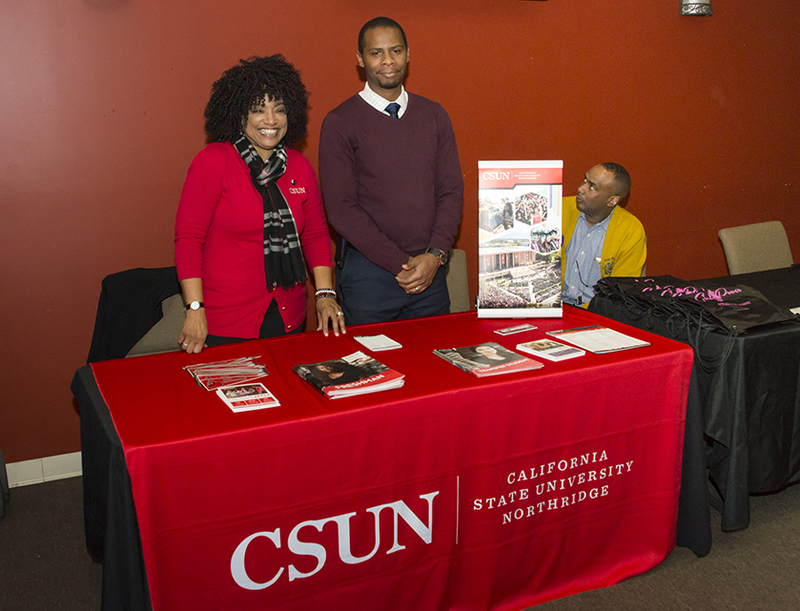 CSUN outreach specialists visited Living Praise Christian Center in Chatsworth as part of the CSU Super Sunday event, where CSU leaders shared personal stories at predominantly African-American churches to reinforce the benefits and achievability of a college degree. Photo by Patricia Carrillo. Four California State University, Northridge leaders shared personal stories at predominantly African-American churches on Sunday to reinforce an important message to potential students and their families: CSUN will work with families to get students into school, and then unlock the life-changing opportunities that come with a college degree. 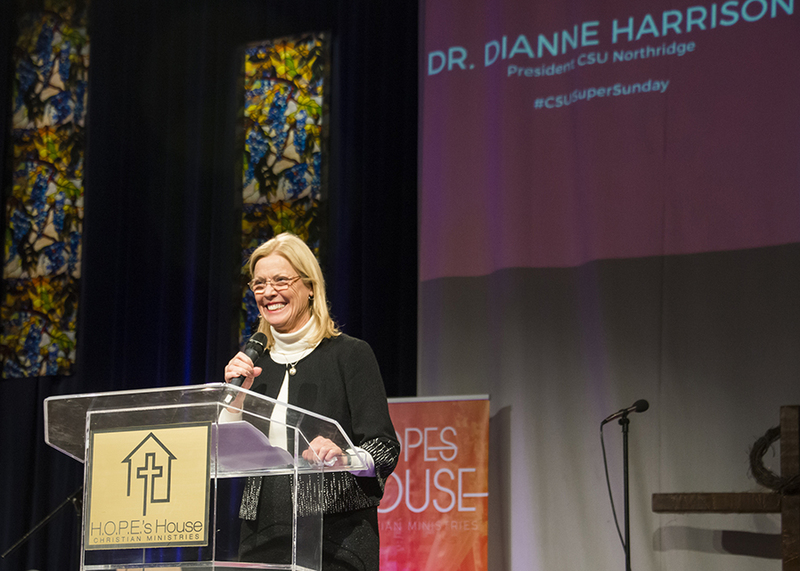 Speaking at H.O.P.E.’s House Christian Ministries in Granada Hills, CSUN President Dianne F. Harrison credited her whole career to her degrees. She also spoke about witnessing the limiting impact of not having a degree — her mother dropped out of school two weeks shy of earning a nursing degree, losing salary for the rest of her career. “A degree in your hand is extremely valuable and can make a difference in lifetime career earnings, as well as opening doors of opportunity that will otherwise remain closed,” Harrison said. CSU Super Sunday is an annual event that aims to increase the preparation, retention and graduation of African-American students. 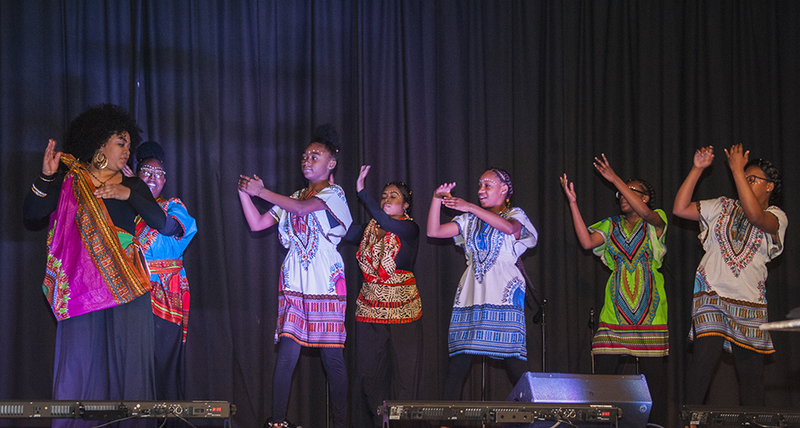 Since 2005, the California State University (CSU) has partnered with California churches serving predominantly African-American congregations, connecting with black families, prospective college students and parents. 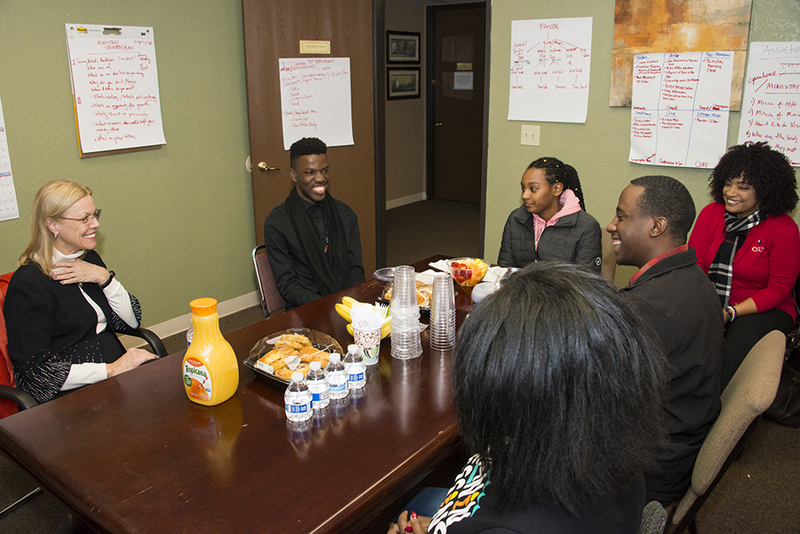 On Feb. 25, leaders, trustees, campus presidents and alumni visited nearly 100 churches across the state to encourage students to pursue higher education. In addition to Harrison, three CSUN leaders delivered speeches at area churches: Vice President for Student Affairs and Dean of Students William Watkins spoke at Ward African Methodist Episcopal Church in Los Angeles; Associate Vice President of Information Technology Ben Quillian spoke at Vessels of Honor Ministries International in North Hollywood; and CSU Trustee Jorge Reyes Salinas ’15 (Journalism) spoke at Living Praise Christian Center in Chatsworth. 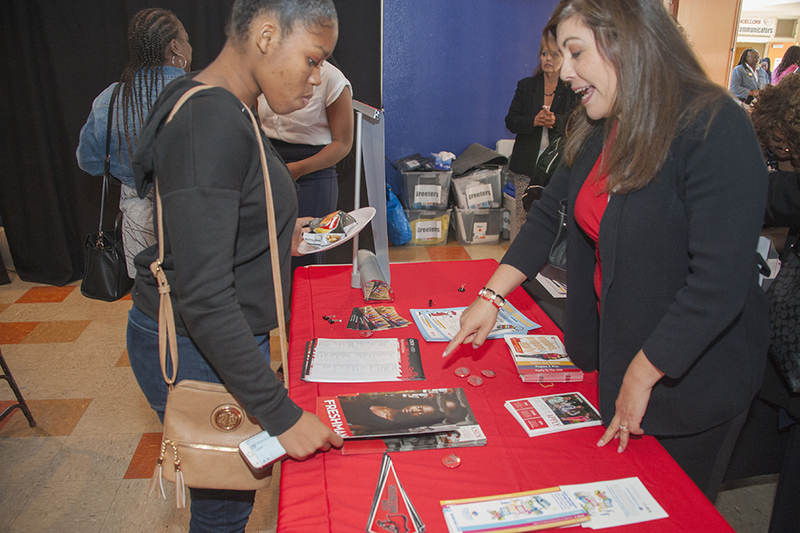 CSUN leaders were accompanied by outreach staff who answered questions about how the CSU serves as a partner in helping students prepare for college — including preparation for the SAT or ACT — the transfer process and financial aid programs. You can succeed at the CSU — whether you’re enrolling for the first time, you’re the first in your family to attend college or you’re returning after time away. Speakers worked to ease concerns about the cost of attending college. They noted that most undergraduates with annual family incomes below $70,000 have their tuition fully covered by grants. Nearly 80 percent of CSU undergraduates receive non-loan financial aid. More than half of CSU undergraduates who earn their bachelor’s degrees have zero college loan debt. Reyes Salinas, who is finishing his last semester of graduate school, emphasized the importance of family support in college success. He encouraged his audience to push their student relatives to stay focused and to keep studying. “Remind them that they are worth an education and they will succeed,” Reyes Salinas said. “You don’t have to be a college graduate to support them every step of the way. Quillian spoke about the impact of higher education on his own family from seeing his father, Benjamin Quillian Jr., who was the first in his family to graduate from high school and later earn a doctorate at Washington University in St. Louis. Benjamin Quillian Jr. later became a faculty member and eventually a senior administrator in the CSU, inspiring his son Ben Quillian III to pursue a career in higher education.